There aren't may makeup products that I use every day without fail but these are the chosen ones! 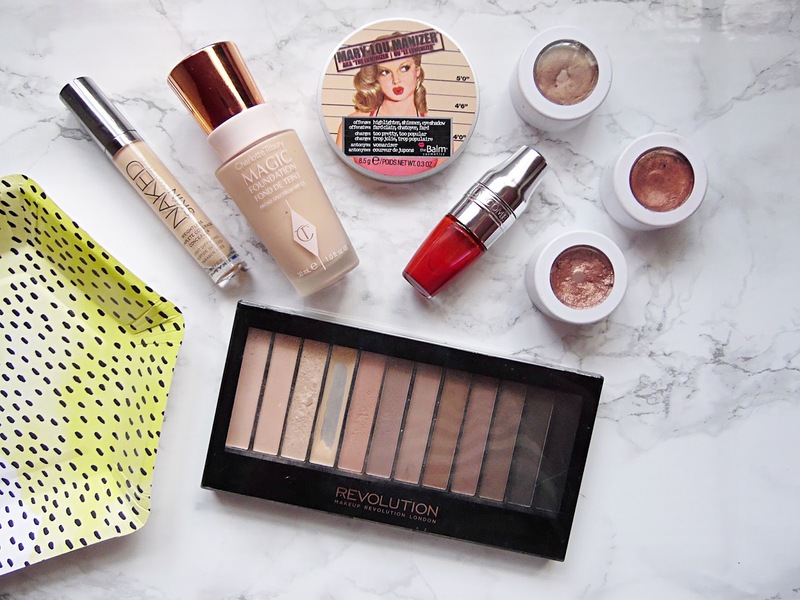 I don't think I could ever be without this selection of products and I always find myself going back to them even when I try to use different and newer things. If you haven't even tried these out, add them to your beauty wish list asap! Colourpop Eyeshadows are the best of the best. If you have never tried them you need them in your life as they are a game changer! I recently brought an Urban Decay Naked palette and was actually disappointed in the pigmentation because I am I so used to Colourpop shadows which are so intense. These have a unique texture as they apply like a cream but feel like a powder. I have a couple of shades at the moment, my favourites are Amaze, LA LA and Smash but I have a few more on the way from America so keep your eyes peeled for a haul soon! Another eyeshadow holy grail is the Makeup Revolution Redemption Palette Iconic Elements. This palette is made up of all matte shades with one shimmer shade and without fail I use this every single day. As you can see I have hit pan on one of the shades and it is my favourite shade from the palette! I use this all of the lid, under my eyes and as a brow bone highlight as it works for everything! I also use the darkest shade on my roots to help conceal them and it does a great job! For lips I have been obsessed with the Lancome Juicy Shakers recently as I love lip oils. These do give the lips a slight hint of colour but they keep the lips so hydrated so I have been really enjoying using them on warmer days. I have two shades of the juicy shakers and I have found myself using Cherry Symphony so much and I never leave the house without one, I want to get my hands on the blue one next. Another lip product holy grail which I some how forgot to photograph is the Blistex MedPlus Lip Balm. This stuff is amazing for incredibly dry lips and it isn't one of those lip balms which you have to keep reapplying as it gets to work immediately! I get extremely dry lips and this is the only lip balm that helps get them back to normal again. I have very picky when it comes to my base products and these three are my favourites which I can always trust! The Charlotte Tilbury Magic Foundation really is magic and whenever I use a different foundation I regret not using this. When I first started using this I thought it was good but not as good as the hype was around it but since I have been using it for a few months now I get why everyone loves it so much. It has such great coverage and feels so lightweight on the skin. I only got the Urban Decay Naked Skin Concealer recently but it has already become one of my favourites. This concealer is perfect to use under the eyes as it doesn't cake up or crease throughout the day. It doesn't feel heavy on the skin and it really does just look like my skin but better. Of course I had to include theBalm's Mary Lou! This highlighter is the prettiest one I have in my collection and I use this pretty much every day. It adds a gorgeous glow to the cheek bones without looking glittery in the slightest.